Winnowing - This technique is based on the chaff being lighter than seeds and so more easily picked up by a breeze. Kathleen Sayce describes the method. The seeds and chaff are held in a container such as a bowl or box with sides high enough to be able to swirl the seeds without spilling. Air movement over the top of the container can be breath or a slight breeze, or just the movement of the container through air. She suggests this be done outside to avoid a mess, although you may want to practice first indoors over a tray to recover accidentally spilled seed. Winnowing is an ancient technique. The cross-breeze may also be applied by pouring the seed and chaff from a height back and forth between two containers. The chaff will blow to the side while the seed falls straight down. Threshing - One way to separate the seed from pods is to let the seeds dry in a paper bag and then give the bag a good bashing. Some pods can be crushed gently with fingers. Other pods are so woody. Kathleen Sayce writes that she grinds in a food mill to scrape the seeds out of hard pods. 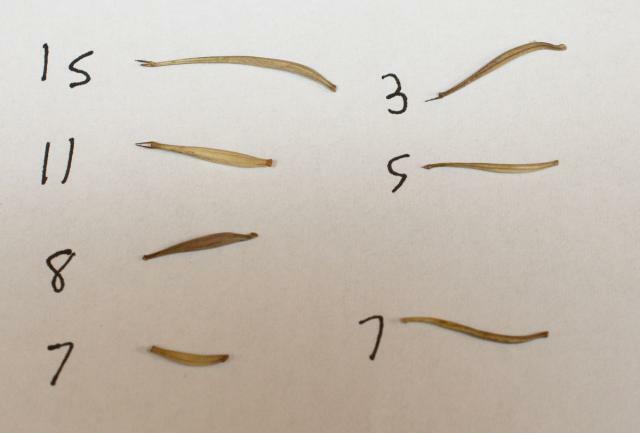 Some seeds such as Camassia or Aristea capitata fall cleanly out of their capsules simply by tipping a stalk of ripe, open seed pods over a paper bag. Particle Size Sorting by Vibration - David Pilling wrote that shaking sets up a particle size gradient, which is another way of describing separating chaff from smaller or larger seeds. 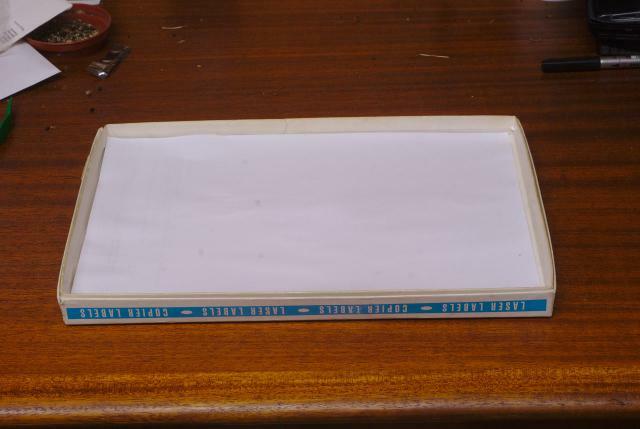 He describes this technique as follows: Lay down a tray (a paper box lid), with several sheets of paper in it. 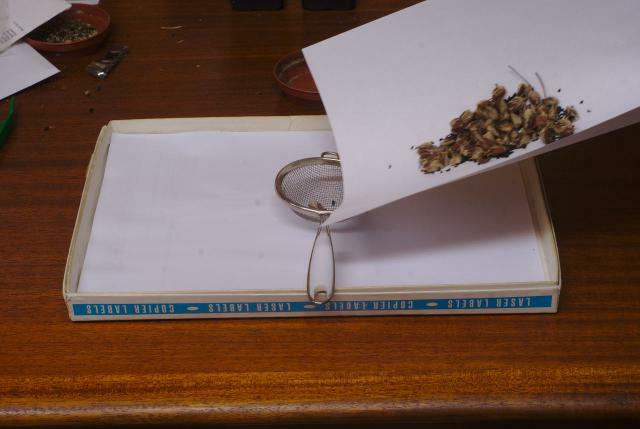 Keep pouring the seed from a sheet of paper in your hand to one in the box lid often via a sieve. Shake the inclined sheet of paper while pouring to set up a gentle vibration on the paper surface. This works best with seeds that roll well and not as well with flat seeds such as Gladiolus. This can be combined with winnowing. Peter Taggart suggests rolling the seed down a fold in a piece of paper, along with judicious blowing. Photos by David Pilling showing the hand powered seed processor. The edges of the tray catch seeds which roll too far. The tray acts as the output side of the processor. 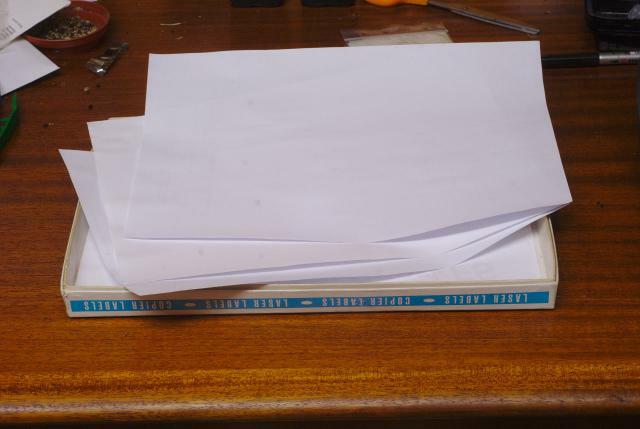 By having many sheets of paper, it is easy to take the output from one pass and use it as the input to the next. Ideally sieves with mesh sizes both bigger and smaller than the seeds are needed, allowing chaff both bigger and smaller than the seeds to be removed. 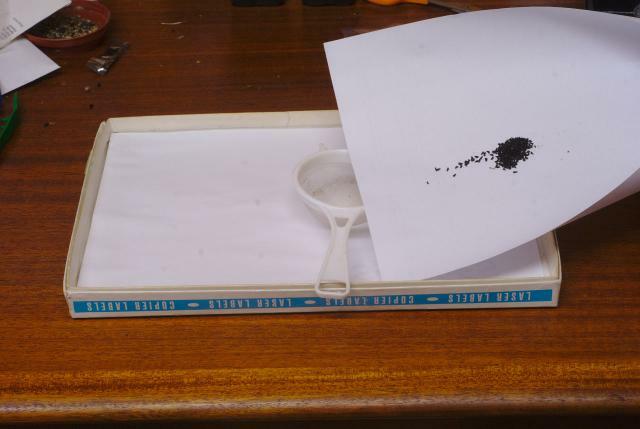 Seeds mixed with chaff are put on a sheet of paper at the right, which the operator curves slightly, angles downwards and shakes; a stream of seeds roll to the left, falling through the coarse sieve and landing in the output tray. The paper from the tray is moved to the right, and a finer sieve is used to remove chaff smaller than the seeds. Eventually the fine sieve holds just the seeds. Sieve- Sieves of various sizes can separate large seeds from small bits of chaff, or large bits of chaff from small seeds. A combination of sieve sizes, one larger than the seeds and one smaller, can be used to separate seeds from particles larger and smaller than seed size. A garden riddle is a sieve. M. Gastil-Buhl suggests a fine sieve for very small particles may be made by stretching tulle fabric (material with a fine open mesh, like net curtains) across a frame. 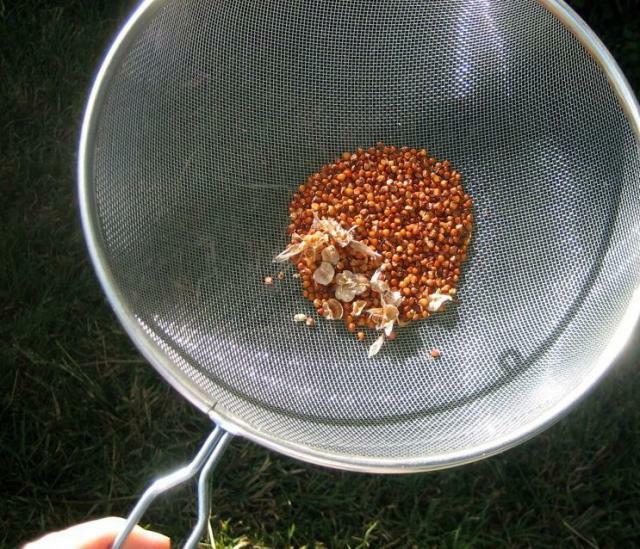 A bowl-shaped kitchen sieve as shown in the photo below may be swirled to sieve and winnow simultaneously, shown with Dierama seeds. 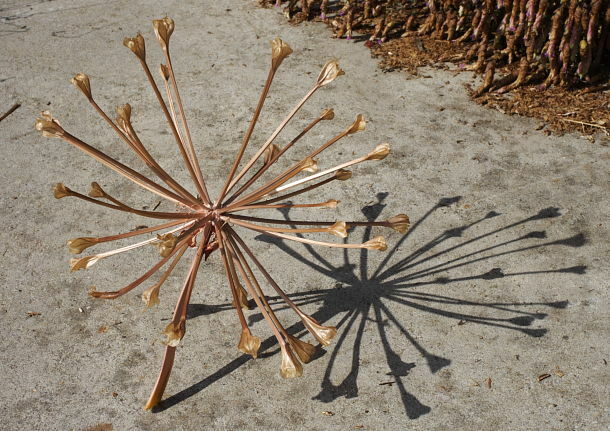 Tumbleweed - The tumbleweed disperses its seed by rolling along the ground in a breeze. Some bulb inflorescences, such as some Allium, are shaped in a ball and so may be rolled as a whole seed head to encourage the seeds to fall out. Machines - Seed from bulbs from private gardens or wild collections tends to be in very small quantity and so not practical to send to a seed cleaning service or process by automation. However, we may learn some principles of separation of seed from chaff by observing how these devices work. Professional seed sorting enterprises have invented seed sorting machines which are available commercially at high cost. Some clever amateurs have devised home-made seed cleaning machines. See for example a video of DIY Seed Cleaning Machine posted from The Real Seed Catalogue. Shirley Meneice mentioned that the Rancho Santa Ana Botanic Garden has a seed cleaning machine made by a volunteer who got tired of cleaning seed. John Grimshaw wrote "Unless you are handling enormous quantities of material I should have thought a manual process would in fact be just as quick as using a machine in which you have to adjust all the settings for each species." Weighing - Two classic techniques for separating seeds are winnowing which has been used for thousands of years and seeing if seeds float, both rely on good seeds being heavier than bad ones. Traditionally weighing seed is implemented by counting a large number of seeds and weighing them all together; it is done like this because seeds weigh very little. Working this way one can detect if a whole batch of seeds is good or bad. Seed weight data is available from Kew SID. 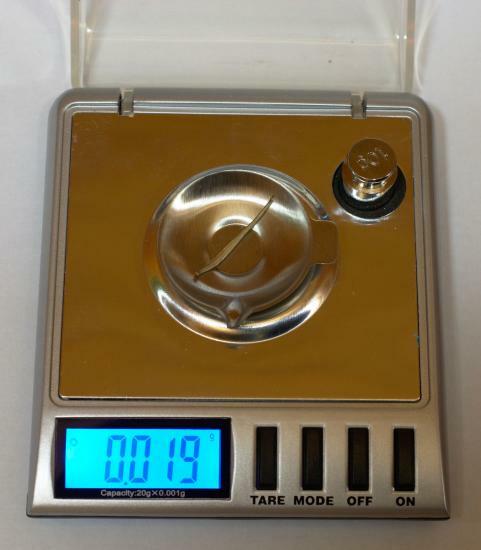 Whilst laboratories have sensitive scales these have been beyond the amateur; but now scales which can measure 1 mg (a thousandth of a gram) are available cheaply. This opens the way to detecting good and bad seeds by weighing them individually. This is not going to be suitable for all seeds or situations. 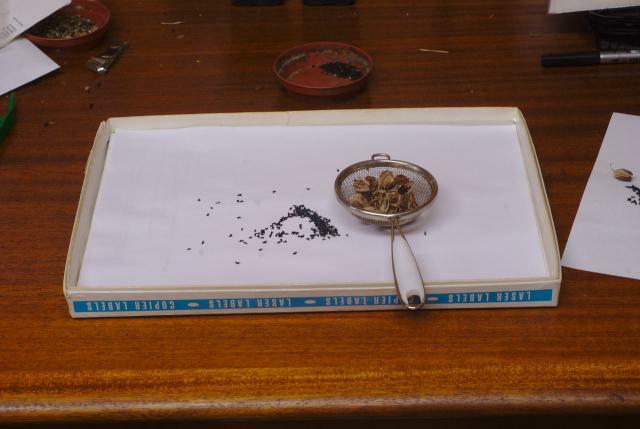 Photo 1 shows a 'diamond balance' and photo 2 shows the contents of a packet of Cosmos atrosanguineus seed with the weight of each seed written next to it. Currently seed of this species is rare and precious. Microgram measurements are possible at low cost for the advanced amateur as various You Tube videos have demonstrated. Cyclamen - John Lonsdale wrote: "I always collect them in the split capsules then let the whole lot dry for a couple of weeks at room temperature. They clean much more easily this way." Dichelostemma and Brodiaea - Nancy Gilbert wrote: "We presently hand clean all our seed with the occasional help of a blender with masking tape over the sharpened edge of the blades. Cracking the seed pods of Dichelostemmas and Brodiaeas takes a rolling pin or the blender and not all are cracked in this process and one has to be careful not to overdo it and damage the seeds. We have sieves and they help also, and we still have to carefully puff away to blow off the small chaff and yet not blow away the seeds. Although this works fine, manually processing the seeds from raw seed in capsules to cleaned seed for storage is often very time-consuming for us." Dierama - Kathleen Sayce wrote: "Dierama seed pods, which are hard and annoyingly slow to clean by hand, requiring that each one be rubbed open. Today I hauled out a (hand powered) food mill and some soil screens, to see if a bit of mechanical tooling would make this easier. I pulled or cut the pods off the seed spikes, ground the pods in the food mill for 10-20 turns per lot of 15-20 pods, then screened the large debris off the seeds. Then I took the partially cleaned seed outside to toss in the air in a large bowl. While still slow, not being able to clean more than 20-25 pods at a time in the mill, the fiddly hand work was much reduced by the food mill's grinding action. The dry seeds are so hard that this did not seem to damage them at all."